Peptide (C)ASAESRDFSGAGGIGVFSE, corresponding to amino acid residues 467-485 of rat NaV1.2 (Accession P04775). Intracellular loop between domains I and II. NaV1.3 - 12/15 amino acid residues identical. 1,2. Guinea pig Anti-SCN2A (NaV1.2) Antibody (#AGP-026), (1:1000). 3,4. 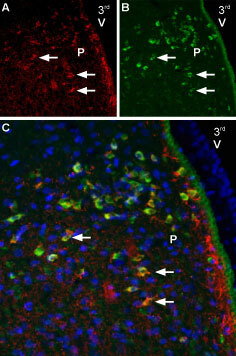 Guinea pig Anti-SCN2A (NaV1.2) Antibody, preincubated with the control peptide antigen. Baker, M.D. et al. (2001) Trends Pharmacol. Sci. 22, 27. Catterall, W.A. et al. (2008) J. Neurosci. 28, 11768. NaV1.2, also known as SCN2A, is primarily expressed in the central nervous system (CNS) and is localized in unmyelinated or premyelinated axons and dendrites. Mutations in the NaV1.2 channel have been identified in different types of epilepsy. Alomone Labs is pleased to offer a highly specific antibody directed against an epitope of rat NaV1.2 channel. Guinea pig Anti-SCN2A (NaV1.2) Antibody (#AGP-026) raised in guinea pigs can be used in western blot and immuhistochemistry applications. It has been designed to recognize NaV1.2 from rat, human and mouse samples. The antigen used to immunize guinea pigs is the same as Anti-SCN2A (NaV1.2) Antibody (#ASC-002) raised in rabbit. Our line of guinea pig antibodies enables more flexibility with our products such as immuno-colocalization studies, immunoprecipitation, etc. Anti-SCN2A (NaV1.2) Antibody (#ASC-002), (for western blot analysis). Anti-SCN2A (NaV1.2)-ATTO-594 Antibody (#ASC-002-AR). A fluorescent labeled primary antibody. It can be used in colocalization studies in conjunction with any of our antibodies raised in rabbit.